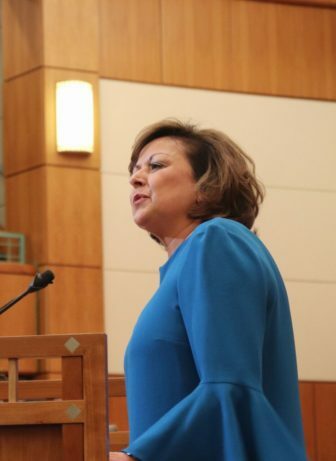 Susana Martinez departed the governor’s office in December granting what appears to be among the fewest pardons in state history. Martinez granted just three pardons—a power that absolves people of guilt in crimes after they’ve paid their debt to society—during eight years in office, a minuscule number compared to her predecessors, Republican Gary Johnson and Democrat Bill Richardson. Those pardons all came in 2012, Martinez’ second year as governor, an earlier analysis through 2017 by SFR and New Mexico In Depth found. The news organizations wanted to see whether Martinez, a Republican, had a change of heart during the final year of her second term. Did she have a Billy the Kid moment, a la Richardson? Did she pardon a friend or political ally at the 11th hour? Records obtained by SFR and NMID suggest the answer is no. Of five people who applied for pardons in 2018, the former governor appears not to have acted on any of them, even after the Parole Board recommended a pardoning in four of those cases, according to the documents turned over to SFR and NMID by newly elected Gov. Michelle Lujan Grisham’s administration following a public records request. The people who applied included a woman convicted of writing bad checks in 1978 who asked for Martinez’s mercy so she could be a “free person in mind and heart,” and a man who filed a bogus insurance claim in 2002 and wanted his voting rights restored, the records show. Tripp Stelnicki, a spokesman for Lujan Grisham, and Jim Brewster, general counsel for the state Corrections Department, say they could not locate any records indicating whether Martinez granted or denied pardons for the 2018 applicants. Efforts to reach Martinez and the applicants were unsuccessful. Pardon power is nearly unique in the New Mexico Constitution. It leaves the decision to restore someone’s “citizenship rights”—including voting, the ability to serve on a jury, run for public office and possess firearms—completely with the governor. Chief executives in this state are allowed under statute to seek a recommendation on pardon requests from the Parole Board. They often do, but the recommendations are not binding. Pardons can change lives, particularly in a state such as New Mexico, where no law exists for people to expunge crimes from their records after a certain period of time. SFR and NMID have run into brick walls for years in trying to examine how Martinez used her pardon power. The Parole Board coughed up a limited set of records in 2013, which led to a SFR cover story showing Martinez had granted three pardons the year before. The newspaper successfully sued the Martinez administration to take a deeper look at those who had applied for pardons and why they were denied. The legal victory, coupled with a massive dataset provided by the Parole Board last year, underpinned a second story, produced by both news organizations. The ensuing analysis revealed that Martinez never granted another pardon request after 2012. Perhaps more strikingly, the number of requests fell off a cliff under Martinez when compared to Johnson and Richardson. Lawyers who had helped clients apply for pardons over the years began to advise people not to bother under Martinez, they told NMID and SFR. The former prosecutor, who appeared to approach her job as governor from a prosecutorial posture, wasn’t budging, the lawyers said. Here’s how the numbers broke out, according to the analysis by SFR and NMID: Johnson granted 113 pardons out of 1,304 requests (8.7 percent) and, under Richardson, 74 of 1,051 applicants received pardon (7 percent). That compares to three pardons granted by Martinez out of 255 requests, when adding the five 2018 applications to the eight-year total. That’s just over 1 percent. The records also show that, by percentage, Martinez was far more likely to deny or ignore recommendations for pardons from her Parole Board. And unlike Richardson and Johnson, who pardoned people the Parole Board recommended against, she never did. NMID and SFR spoke with eight longtime New Mexico criminal justice observers, including retired judges and lawyers who worked on pardon applications dating back to the 1960s. They all said it is “likely” Martinez’ pardon record is the stingiest among governors since statehood in 1912, but none could say for sure. The New Mexico Sentencing Commission had no data that could answer the question. Felicia Lujan, division director for the New Mexico State Archives, said no easily accessible records exist that would show pardon figures for every governor in state history. The archives likely contain documents that would show how each governor has used their pardon power, Lujan said, but compiling a list could take months of research. It is not clear what will become of the five 2018 applications with a new governor in office. Of the five pardon requests Martinez received in 2018, the Parole Board recommended against pardoning Dawsie Gremillion for filing a phony insurance claim against a gas station in 2002. But the board endorsed pardons for Benigno Chavez, convicted of domestic violence in 2010; Melissa Hamby, who was 19 when she was convicted of auto theft and conspiracy in 1988; and Mary Beth Gosson who, at the age of 22, wrote a handful of bad checks in 1978. The board also urged Martinez to pardon Faury Gonzalez, a Cuban national convicted of conspiracy to traffic a relatively small amount of crack cocaine in 1995. It was Gonzalez’ third try—Richardson denied him a pardon in 2008, and Martinez shot him down in 2013. Gonzalez, who has opened his own business in Florida, wanted the pardon in order to become a US citizen so he could visit his children and grandchildren in Cuba, according to the documents obtained by NMID and SFR. This story was co-published with the Santa Fe Reporter, a NMID partner.